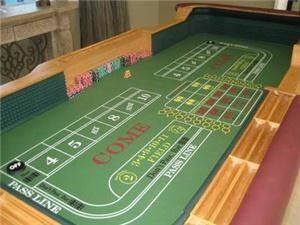 We post our prices, real pictures of our casino tables and party photos from our events. The price you see is the price you pay and everything from casino tables, chips, chairs, cards, delivery, setup, breakdown, raffle, prize and REAL casino trained dealers is included. We have 5 star reviews from customers all over the nation. All of our casino trained dealers can deal Blackjack, Poker, Texas Hold'em and more on our unique gaming tables that seat 9 players.